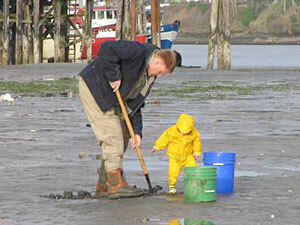 In nearly every Oregon estuary, some species of bay clams can be found. However, abundances and variety of species is different for each bay depending on a number of factors. Size and shape of the bay are the most critical factors. Tidal exchange, salinity, species ranges, and substrates also weigh heavily. These maps outline areas that are most commonly accessed by recreational diggers. 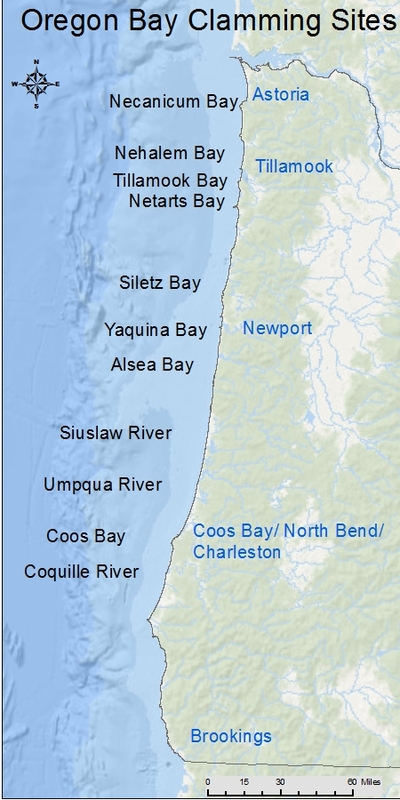 Chetco and Rogue river basins have high freshwater influence, and therefore no accessable bay clams. In some of the south coast's rocky nearshore areas, littleneck and butter clams can be found under rocks and amongst gravel. Due to the tough terrain, very few clammers harvest on the rocky nearshore of the south coast.